With everyone on countdown for the final season of Game of Thrones, and seeing as how Winter Is Coming (pun very much intended), we decided to try the DMK Enzyme Facial (better known as the Game of Thrones or Dragon facial, for reasons which will be revealed a little later), and see what all the hype is about. 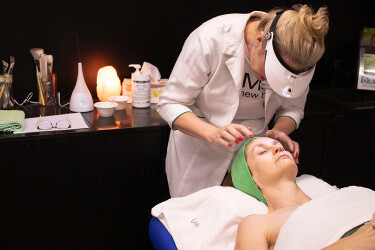 DMK Skin Revision Treatments (they aren’t even called facials), created by botanist Danne Montague-King are different to most other facials on the market, in that they work with your skin’s internal functions and structures. DMK explain it as if you think about looking down through the top of your skin and imagine the skin functions and structures are like a factory and what this factory produces is what we see on the surface of your skin! If the factory is not functioning optimally, then the product the factory produces will not be the best possible quality product that the factory can produce. Everything that presents itself on the surface of your skin is a direct replication of what is happening within the skin. With this in mind, the plant-based signature Enzyme Therapy helps to ensure optimal skin function by turning dead cells to a weak acid and flushing them from your skin. Reverse osmosis clears away cell debris, toxins, oxidised waste and free radicals while also helping to increase oxygenation, cell metabolism and immune functions via a plasmatic effect on the blood and lymph circulation. This process helps to stimulate the fibroblast cells to enhance collagen production – just what mature skin needs. The therapy treatment started off like most others, with a skin analysis, cleanse, pre-enzyme treatment, and hot towel, and then the fun really began. The Enzyme Mask is applied and left to harden. And harden it does – to the point where you literally can’t move your face, and can feel your blood pumping underneath. I should mention that as it hardens, you do start to look like a Game of Thrones character, and this is where the treatment gets its nickname, as you can see in the image. This is not at all painful or uncomfortable, it just means you can’t move any muscles. The enzymes in the mask are working to help stimulate circulation, and as the mask hardens, it forces your body to pump blood, oxygen and minerals to your face. After 45 minutes, the mask is softened and gently removed, and a vitamin infusion applied. Click here or below to watch a time lapse video of the mask hardening. The end result? My facialist asked me how my skin was feeling, and it took me a minute to formulate an answer, because I literally couldn’t feel my skin. No tightness, no oiliness, no uncomfortable itchiness, just skin. I just felt like my skin was happy. Then I looked in the mirror, and it was just glowing (and a little red from the stimulation, but not so red I couldn’t immediately head off and go shopping). I had the treatment three days ago, and my skin is still glowing, and hydrated. Did I like it and was it worth the hype? Well, I’ve already booked in for the next one, so it’s a huge yes from me. NB, all images are unfiltered – what you see is what you get. Sounds like it would be a great treatment. I will have to investigate if I can get this done locally. You should if you can – it is a brilliant facial/treatment.